Day 6 of vacation started just like any other. We had breakfast together in the dining room, then enjoyed some down time in our suite. For the first time ever, we decided to skip going down to the beach for the day. Instead, we opted to spend the afternoon at the pool! After a few hours of enjoying the pool, lazy river, hot tubs, and water slides at our hotel, we headed back up to our suite for showers and dinner. 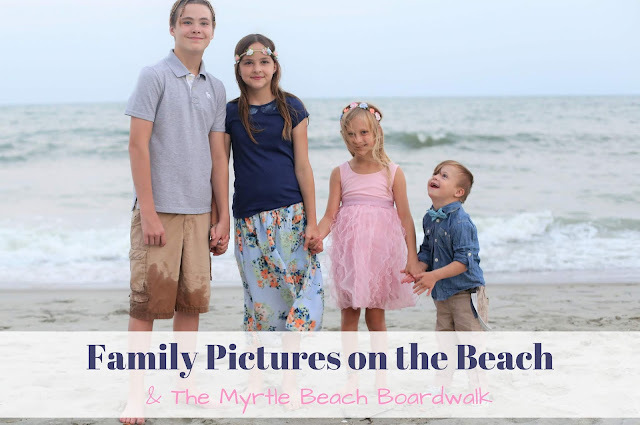 The kids got dressed for our photo shoot, and we headed out onto the Myrtle Beach Boardwalk. It was a busy night on the boardwalk, and the kids had lots of fun along the way! That just might be why we were so late getting to our photoshoot. We couldn't help but stop to visit with a stormtrooper and a pair of well-trained macaws! We finally arrived at the beautiful spot we discovered at the very end of the boardwalk! It was perfection! I usually just take pictures of our kids, but this year, Lexie snapped a few of me and Grant, and each of us took a picture with our kids. I'm so glad we did. By that point on our trip, Dylan and Lexie knew about the baby, and it was our little secret! Next year, when we have more time (and another child), we want to take a family picture, too! As usual, some of our kids were more cooperative than others (I'll let you decide which ones), but I managed to capture a few good pictures of each of them! Dylan - Age 13 - Cool, aloof, and rocking his beach braids! Alexandria - Age 11 - Sweet, Smart, and not yet aware of just how beautiful she is! Liam - Age 5 - Joyful, Charming, and full of love! And, of course, a few group pictures! By the time we were finished, it was dusk. With our photoshoot done earlier on our trip, we were able to breathe a sigh of relief, and look forward to one last awesome day of vacation that was commitment-free! We were all happy and relaxed on our walk back to the hotel on the boardwalk! As I look at these pictures, and see all the happy faces, I can't help but get excited about our next family vacation! We LOVED our trip to Myrtle Beach, and I have a feeling we will be going back next Summer. And next year, our family will be bigger! We can't wait to introduce our baby boy to all of our family vacation traditions! All of your family pictures turned out so good! I could not love those pictures of little Liam with his hand on his hip any more if I tried! Just precious! You got the best pictures from the beach. I LOVE them. I also love Dylan's hair. Brings back memories when I was a kid and everyone did the braids in their hair!!! You have a beautiful family! I love following along. Have a great weekend! This post makes me smile! You did great on the photos of each kid. Those macaws are awesome too! Aw, beautiful photos. I love that you and your husband got in some of them too.